It seems that every few months I drop clean off the radar and stop updating my blog. Don’t worry, I’m still pursuing my goals. It’s just that the time gets away from me. I still write in my journal and believe me some of those posts would make for some REALLY good blog content. I sometimes think I’ll one day go back through those journals and add the posts I was writing at the time. It never happens. I end up thinking to myself it is self centered to believe even in a short absence I should have the gall to return as if nothing happened AND write about the past as if I don’t know the outcome….smh…that’s what my journal looks like. The incredible rants of a lunatic. Is that even a word? Anyway, a lot has changed since I posted in November of last year. I left my soul sucking day job and am now free to do what is necessary to grow the magazine, advance my technology career, and still eat. It’s a liberating feeling. Also, it’s that time of the year again. Time for the ‘Geeks’ to come out at night. I love the spring. I missed some really good conferences this season due to my SSDJ. I didn’t have the courage to apply for one of the scholarships they were giving to women interested in code so I missed out. Now that I have the courage I’m not sure what to say on the applications so I missed out on another. It’s ok though! My first love is this weekend. WordCamp 2015, Baby! I’m really excited. I’ve spent the past several weeks pulling somethings together so I have something to show this year. I’m on the hunt for something in tech. 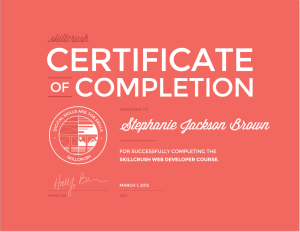 I officially finished the front end web developer course on both Skillcrush and Treehouse. 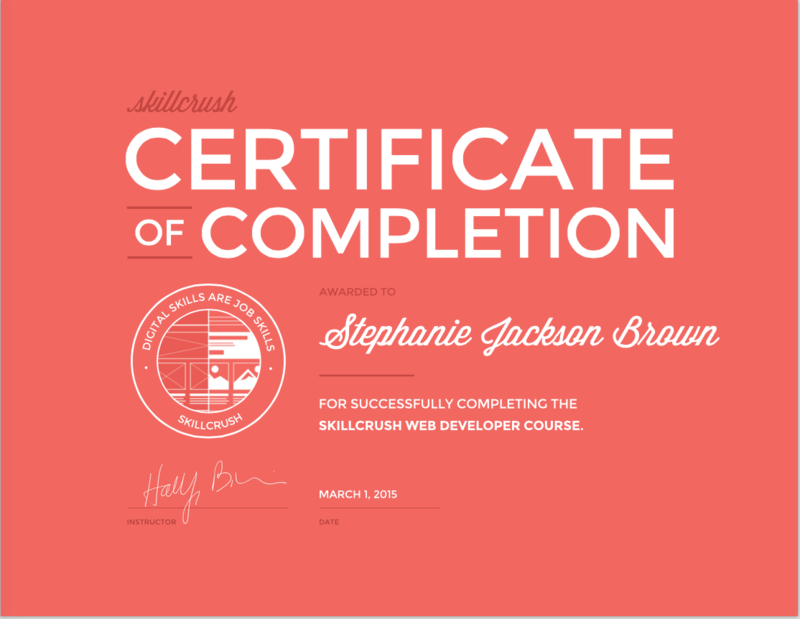 Skillcrush wrote for me a really nice recommendation and the certificate is really pretty. Treehouse doesn’t have a certificate. Instead you have a profile where they show every badge you’ve completed. It’s pretty colorful and creative. That course was one I thought I’d literally NEVER finish. Each time I got just shy of the end they’d add or significantly change the course. In the end I was determined to get it DONE! Lol. Now, despite the overwhelm I’m learning that knowing the information simply for the sake of knowing it doesn’t really cut it. I’ve got to apply it. AJ had it right all along. She absorbs things in the manner of which she’ll need them. To her it’s useless to learn something you’re not going to use immediately instead of learning what you need to advance you to the next level right now. Not really sure why I don’t think like that. I want to know EVERYTHING about EVERYTHING in order to feel unlike an imposter. So, I finished the courses. Now, I’m back tracking to learn how to use the frameworks that will make my life easier. The cool part of all this? I know how it all works and can write it from scratch if I need to. Now I just need some designer friends who want to make their designs come to life. Time to build the portfolio.